The Fighting Saints men’s basketball team matched up against College of Saint Rose in Albany, N.Y., and lost by a score of 95-56, which brings their overall record this season to 5-2. The women’s basketball team was also in action against NJIT, and they also lost by score of 71-50, moving to 2-1 overall. The Lady Saints matched up against NCAA Division I opponent NJIT and lost by a score of 71-50. By halftime, the Saints trailed by just two points at 30-28. NJIT outscored the Saints in the third quarter 24-10 and ended the fourth by outscoring the Saints 17-12. The Lady Saints got 21 points and 7 rebounds from senior Arreonte Anderson, an NCAA D-I transfer who shot 8-for-16 from the floor, including 4-for-5 on 3-pointers. Senior guard Mookie Kennedy also added 9 points of her own, while senior center Regina Steele led the Saints with 10 rebounds. Her 9 blocked shots were one shy of the NJIT opponents’-record 10 blocks. 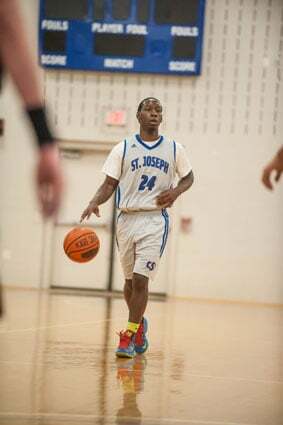 The Saints men’s basketball team took on College of Saint Rose and lost by a score of 95-56. Saint Rose is an extremely tough NCAA D- II opponent that was just able to out play the Saints. CSJ was outscored 40-22 in the first half, and that made it tough to come back from. Saint Rose held a decisive 35-17 advantage on the glass, and recorded 27 assists to just nine for the Saints. Kyle Houston led the Saints with 14 points, while Kareem Brown added 10 of his own.